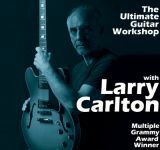 Larry Carlton, 15 time Grammy Nominee and 3 time Grammy Award Winner, will come to the Saint John School of Rock and Film on June 24, 07 to host the ultimate guitar workshop. It is a once-in-a-lifetime opportunity to meet and learn from one of the greatest guitar players of all time. It is Larry Carlton's only stop in Atlantic Canada, coming straight from Aspen, where he is performing a gig with Herbie Hancock. During the 1970s, Carlton was a busy session musician in Los Angeles, appearing on up to 500 recordings a year, including albums by Steely Dan, Joni Mitchell and Quincy Jones. His loopy, dazzling guitar work on Steely Dan's "Kid Charlemagne" from their 1976 LP “The Royal Scam�? has been listed as the third best guitar solo on record by Rolling Stone Magazine. Carlton's impressive list of credits includes appearances on over 100 GOLD albums. Known throughout his career for his smooth sound, live performances and compositions, who will ever forget his Grammy Award winning theme music for the hit television series ‘Hill Street Blues’ (1981). Showing his staying power, his live performance in 2001 with Toto lead guitarist Steve Lukather, “No Substitutions: Live At Osaka�?, garnered his third Grammy. Carlton continues to record albums and tours regularly around the globe.